The Climbing Technology BE UP is a versatile hot-forged belay/abseil device compatible with all ropes and types of climbing, boasting unique functions that no other device has or is capable of performing. The Climbing Technology BE UP has everything you'd expect from a modern belay device - a lightweight a strong design, modular "V" notch braking system for enhanced control when belaying and descending, a shape that allows for seamless belaying of the leader - but the unique element of the BE UP is its ability to allow the auto-locking and independent belaying of two Seconds. Effectively, whilst one free-hanging Second is locked off, the other can be brought up, or lowered, completely independently and safely. Also works when leading with two ropes. 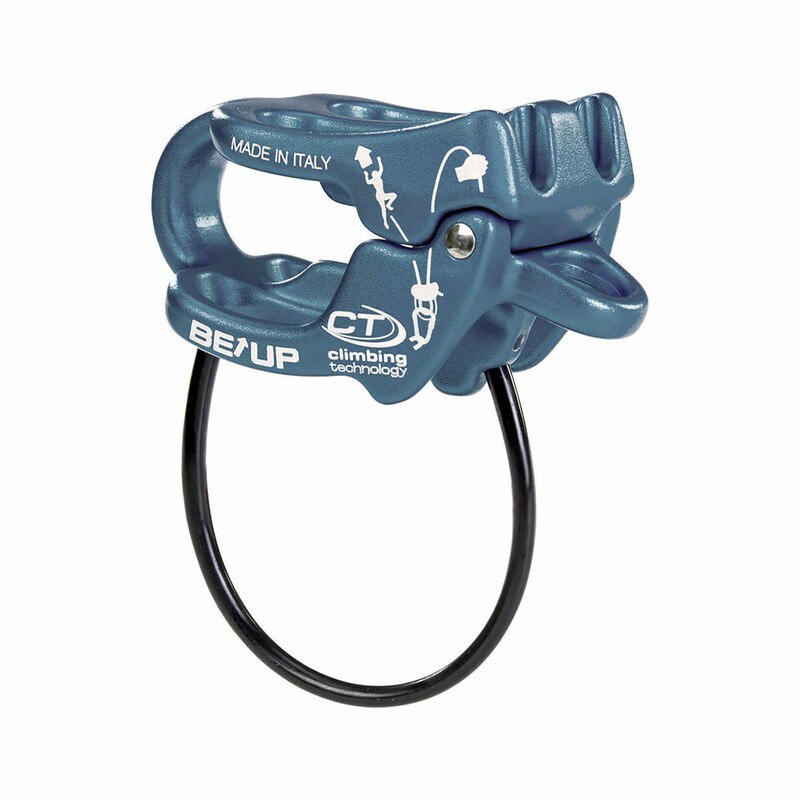 The BE UP is thus suitable for all belay/abseil situations but is highly effective and advantageous in guide mode and when belaying two Seconds in the event of needing to make one person safe and focus completely on the other. •	While belaying the leader on a multipitch route using two ropes, the BE UP lets you pay out one rope while the other is locked-off, the only such device that lets you do this. •	The unlocking of the rope and lowering of one free-hanging second, without difficulty, with twin or half Ø ≥ 7.3 mm ropes. BE UP is the only such device that lets you do this, simply by inserting a normal HMS carabiner in the unlocking hole. •	The bringing-up of one or two seconds with auto-locking, and each second being belayed independently of the other (in guide mode). The BE UP‘s special shape and the attachment ring built into the body allow you to bring up one or two seconds using twin or half ropes with Ø ≥ 7.3 mm. You can continue to bring-up one second while the other is hanging with their rope locked-off in the BE UP. •	Effective belaying of the leader. The particular shape of the BE UP‘s body allows rope to be paid out fluidly, rapidly and without jams or twists. •	Rapidly switching from taking-in (guide mode) to belaying the leader, for leading through. Plasticised steel cable, so you can‘t drop the BE UP and to limit its movement during belaying. I have been using this device for over 2 years and I can assure you that this is definitely the best belay device that I have ever used! When you belay someone who's leading a route you can give the rope really fast when he/she is clipping. I have used this device with multiple ropes (thin and thick) and they all go through the BE UP really smoothly. I have also been using it when climbing multipitches and belaying the second climber on guide mode. It also works really well with two ropes and it's great for abseiling. So, if you need an all-around belay device (from indoor sport climbing to bigwalls), the Climbing Technology BE UP is the perfect belay device for you! I use a petzl reverso and dmm mantis for work and personal climbing and i bought this item for my partner to have a safety/backup friction plate in our rack. I have to say this tool is amazing, handles ropes smoothly and racks better than a reverso. I would recommend to all who like to set up guide mode and looking for an excellent all around friction plate.